My husband and I just returned home from a magical vacation in Alsace. Our goal was to drink some good wine (of course!) 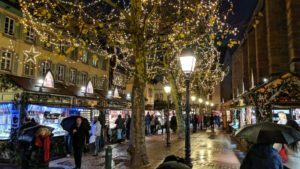 and to visit the world famous Marchés de Noël (Christmas Markets) in the region. This charming region in France certainly did not disappoint! 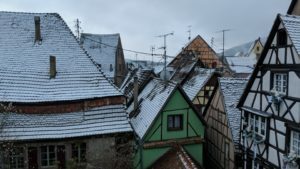 Located in the eastern part of the country, Alsace is very close to both Germany and Switzerland. 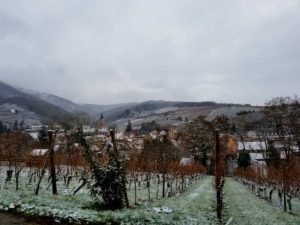 In fact, the Rhine River runs along the region to the east, and the Vosges Mountains to the west, making it an ideal spot for growing wine grapes. 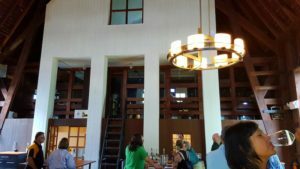 Riesling, Gewürztraminer, Pinot Blanc and Pinot Gris rule here, but they also have a bit of Pinot Noir. The wine I’m focusing on today, though, is the Vin Chaud! 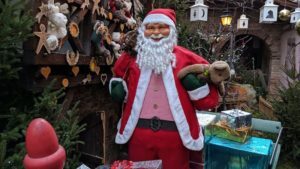 The many Christmas markets in the region all sell this hot mulled wine full of spice and much-needed warmth. You can get a cup of red or white. The wine is steeped in the spices to infuse the flavors without using heat because the heat used in that process can evaporate the alcohol (and what fun would THAT be?) and bring out unwanted flavors from the wine. One vendor even had some Vin Chaud spiked with Grand Marnier! That was my husband’s favorite! The markets also have fun rides for children and loads of traditional French food like crepes, pastries, marzipan and tons and tons of chocolate! And of course, there are lots of trinkets, ornaments, and gifts to take home. 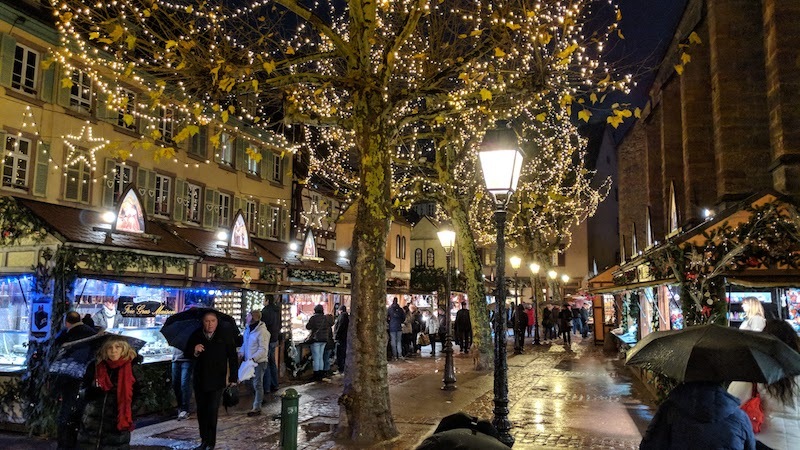 We stayed in the small storybook village of Riquewihr, where we strolled the market and shops every day and evening. This quaint village took us back in time, and we fell in love with the town and its people. The locals go all out during the holidays. 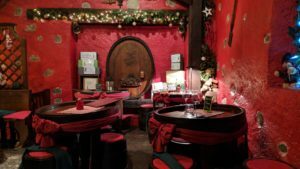 Every timbered building is adorned with Christmas decorations galore, and we felt as if we were in the most Christmassy (is that a word? If not, it SHOULD be!) place in the world! 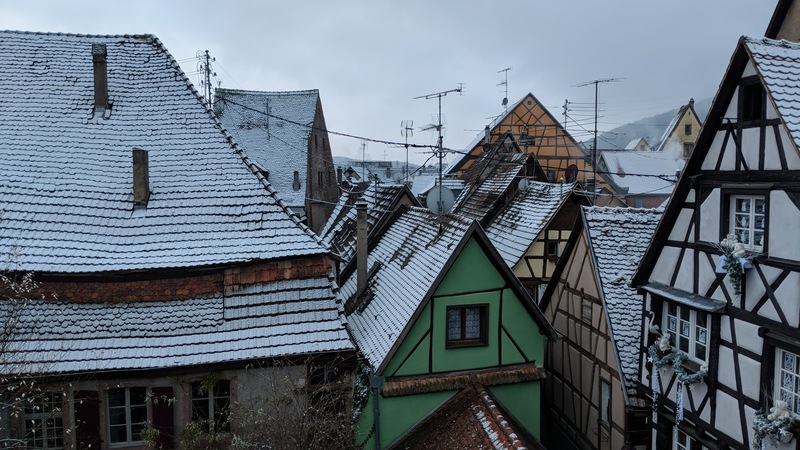 We also ventured out to the village of Colmar. 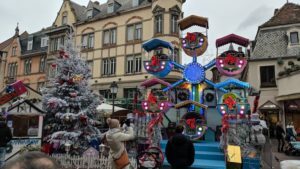 Much larger than Riquewihr, Colmar has FIVE fabulous Christmas markets, as well as an indoor farmer’s market (Le Marche Couvert de Colmar) with a delightful coffee shop called Un Monde de Cafés, lots of fresh produce, pastries, and other delicacies. 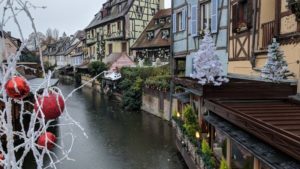 Colmar is nestled among vineyards, with colorful buildings alongside the canals, Christmas decorations and fabulous cafés making this a magical place indeed. 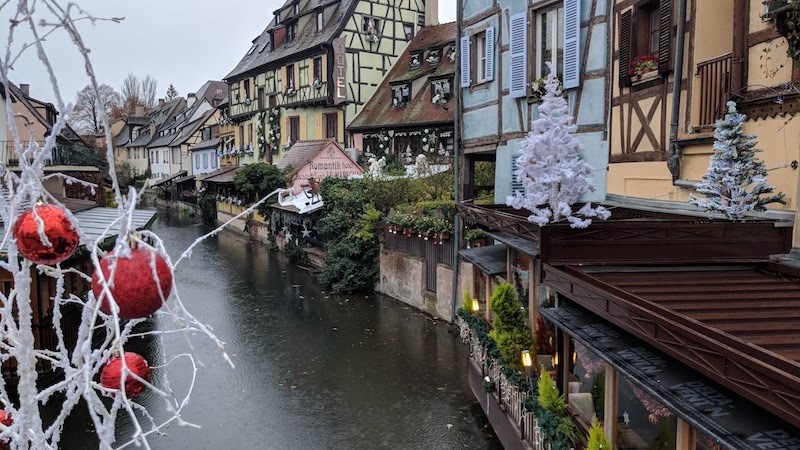 Colmar is considered the “Capital of Alsatian Wine”, so you can count on plenty of cozy spots to duck in for a glass of Cremant d’Alsace or other types of Holiday cheer! 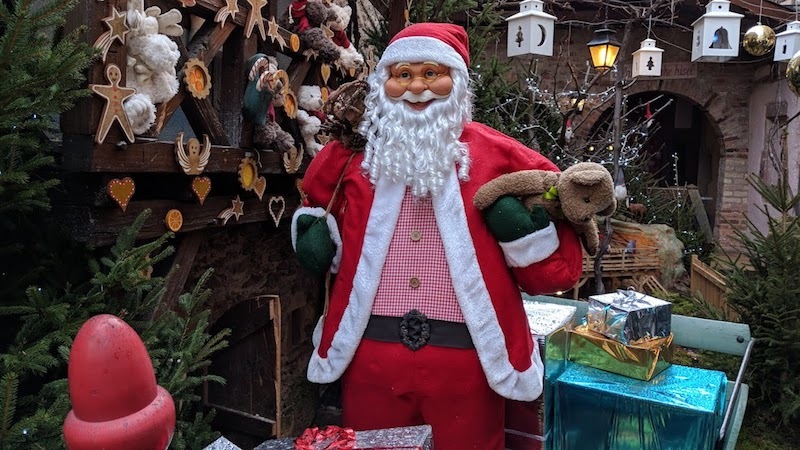 The region of Alsace certainly does the Yuletide right! 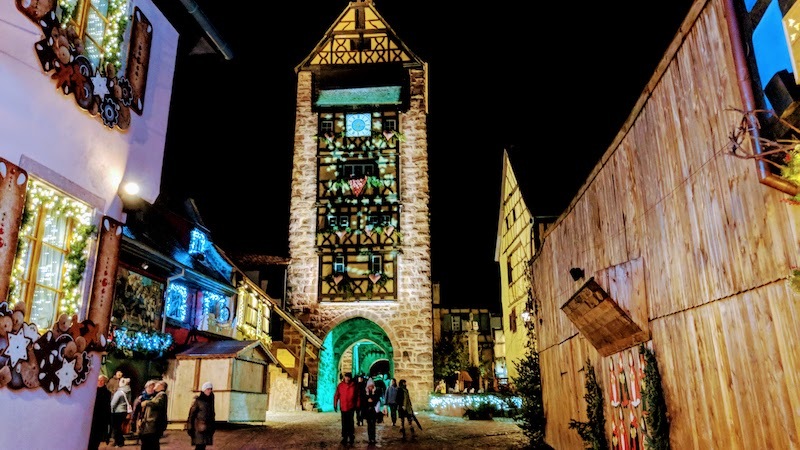 If you’re a lover of all things Christmas and looking for a magical spot to relish in the season’s spirit, you can’t go wrong in Alsace. You’re sure to find Christmas magic in this real-life fairy tale land! I love road trips! I especially enjoy road trips that include a fun new beverage experience. 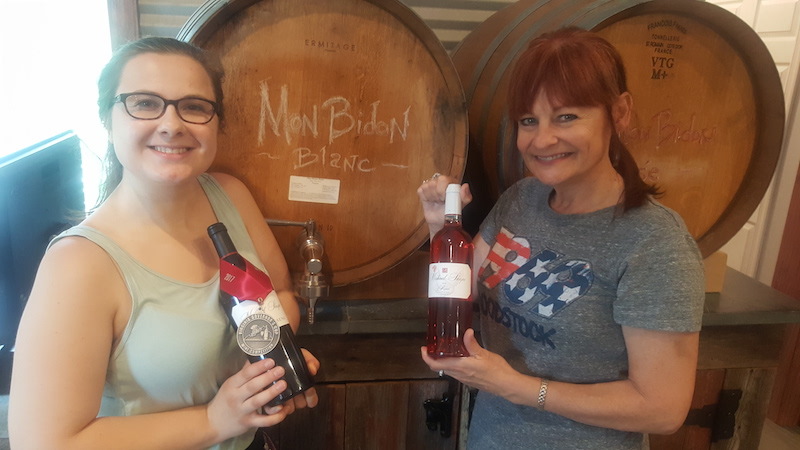 Now we all know that Florida isn’t known for its wine, but there are a lot of great craft breweries popping up in the Sunshine State! My husband and I hit a couple last weekend while on our latest road trip to the Jacksonville area. My favorite of the trip??? Aardwolf Brewing Company! 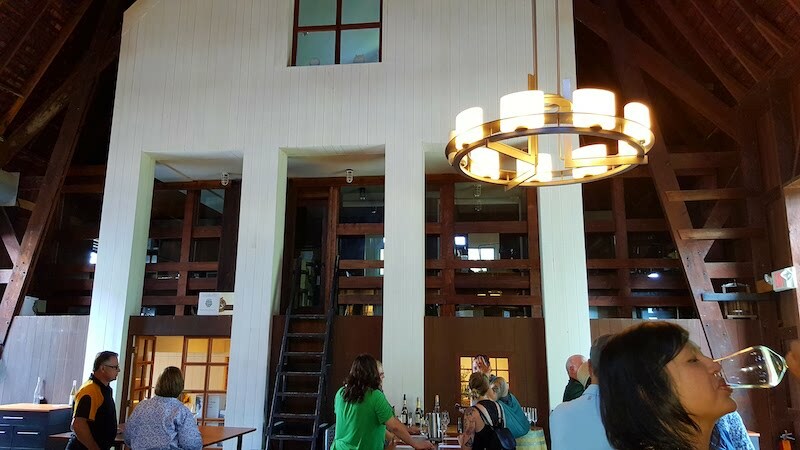 Housed in a really bitchin’ old building that used to be a railroad icehouse (located in the Jacksonville’s trendy San Marco neighborhood), the atmosphere is enough of a reason for a visit. The beer??? Oh yeah … more than an added bonus! 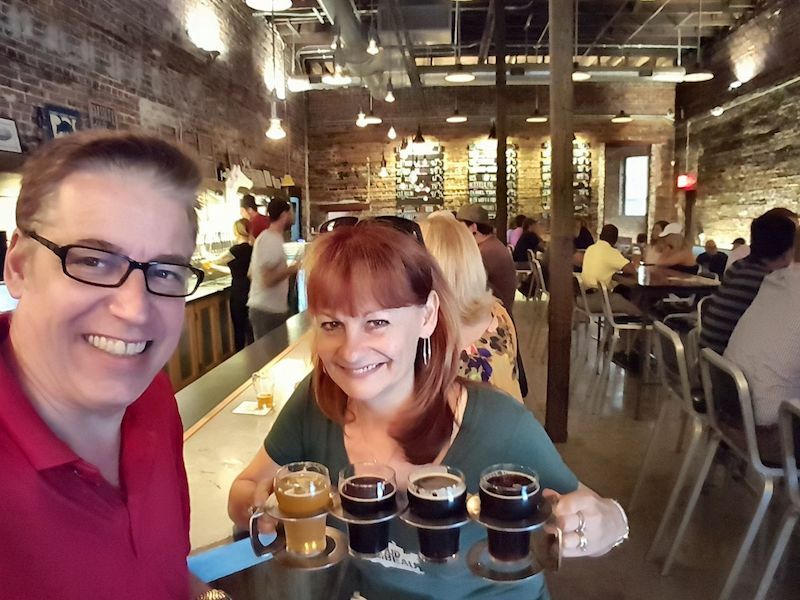 John started out with a glass of their White Russian Stout (which ended up being my favorite of the night) and I started in on some flights! 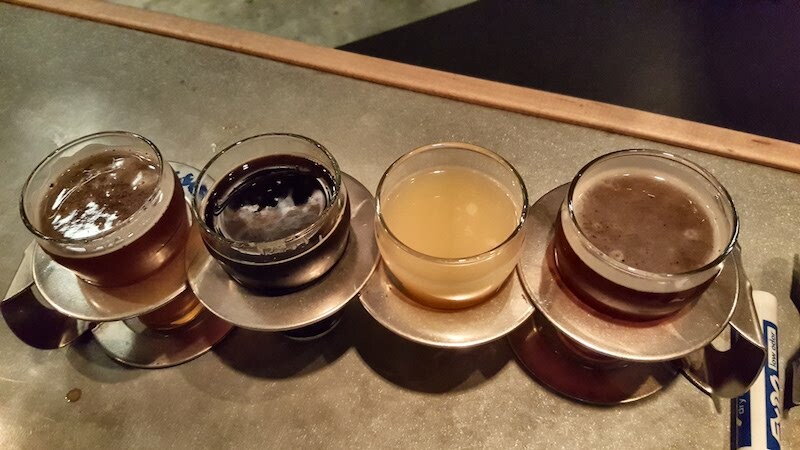 Okay, I need to admit right here and now that we tried a bunch of different beers that night. That’s the great thing about flights though, right??? 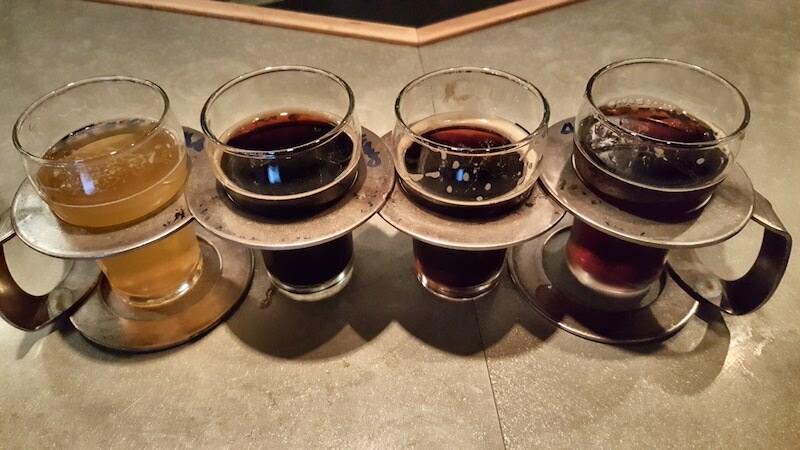 You get to try a little of everything. Well, sadly not EVERYTHING, as they have a lot of choices. 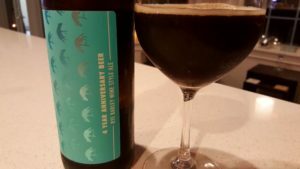 Hopped Be Thy Name – I’ve been really into IPAs lately, and this doesn’t disappoint. It’s a well-balanced Double IPA with lots of citrus along with a nice creamy mouth feel! San Marco Sour – Along with the IPAs, I’ve also recently been getting a kick out of trying sour beers. It’s a new thing for me, but not for the world! 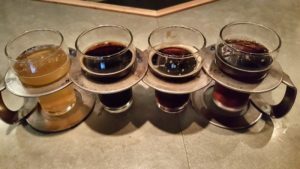 Sour beer is actually the oldest type of beer in the history of beer! 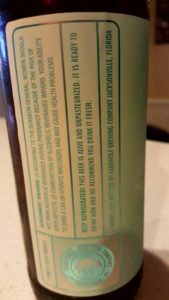 Before brewers completely understood the whole pasteurization and sterilization thing, pretty much all beer was somewhat sour. Add to that, nowadays most of the well-known beers are made with specific yeast strains, not the native yeasts of yesteryear! 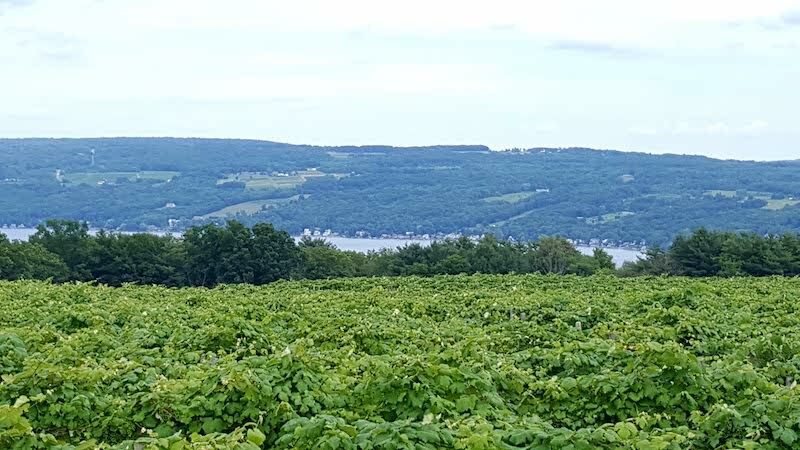 More and more people (both in the beer world and the wine world) are using native yeasts, which can make the beverages very interesting indeed. Aardwolf’s San Marco Sour is golden in color (in fact, it looks a lot like orange juice!) 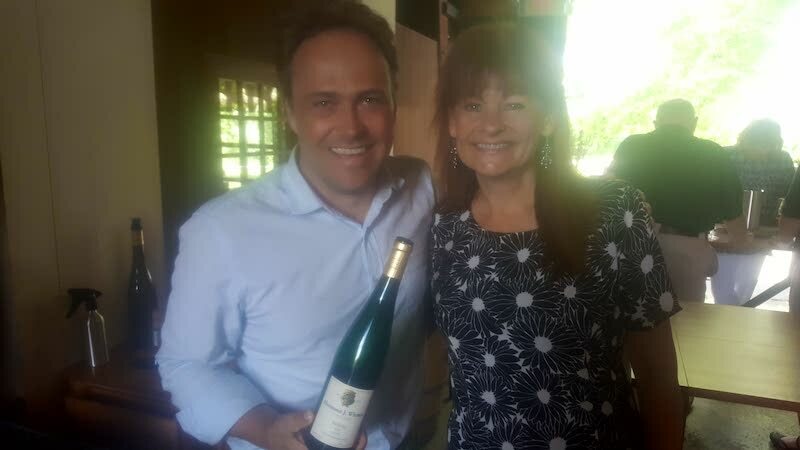 with a palate of tart unripe peach and pear. It’s sour, but not TOO sour. This beer is the perfect thirst quencher for a hot Florida day. To me, it’s the beer equivalent to a nice Sauvignon Blanc! 4 Year Anniversary Beer Rye Barley Wine – Okay, so I’m a wine pro not a beer pro, and this ISN’T wine, but it is really tasty! The color is dark amber and it tastes of caramel and toffee. I could definitely drink a lot of this, but at 9.7% ABV … I should probably be careful! 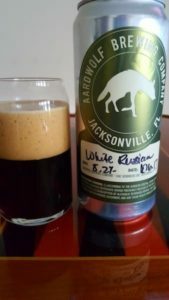 White Russian Stout – Oh wow, how I love this dang beer! I can’t get enough of it. We bought three Crowlers (32 oz. can, not to be confused with a Growler) to go, but I wish I could just install a tap in my house with a direct supply! It’s super creamy on the palate with roasted coffee, chocolate, and an almost sweet vanilla bean. It’s oh so rich, smooth & silky. I absolutely adore this beer, can you tell??? 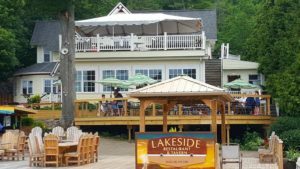 Although they have a fun outdoor patio at the entrance, we bellied up to the bar when we got there and the service was phenomenal. 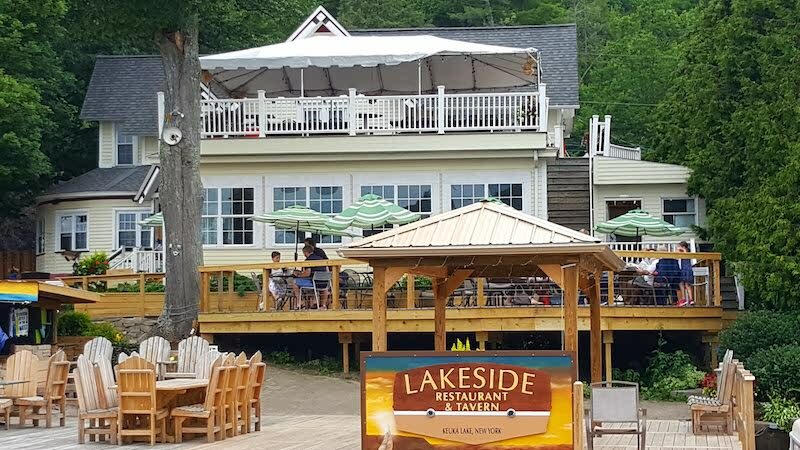 The vibe is really cool here, they have really great beer, AND they’re dog friendly!!!!!! How great is that? They’re also kid friendly, so there are no excuses to not pay them a visit. 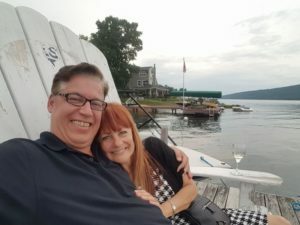 My husband and I are on a summer adventure. 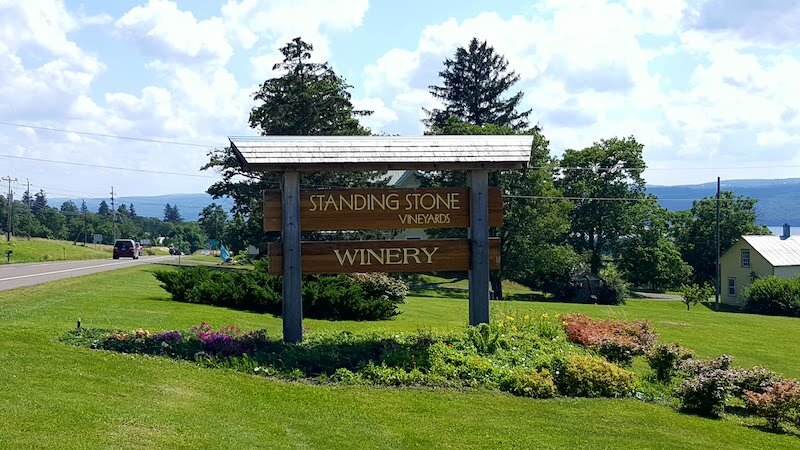 We’re taking five weeks going up and down the east coast, tasting a bunch of wine and beer along the way. 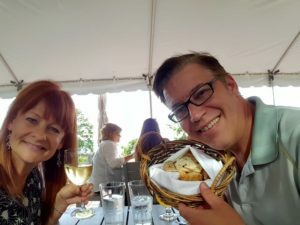 Neither of us had ever been to Virginia Wine Country before (we were calling ourselves Virginia Virgins! 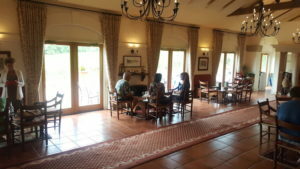 ), so we decided on this region as our first wine stop! 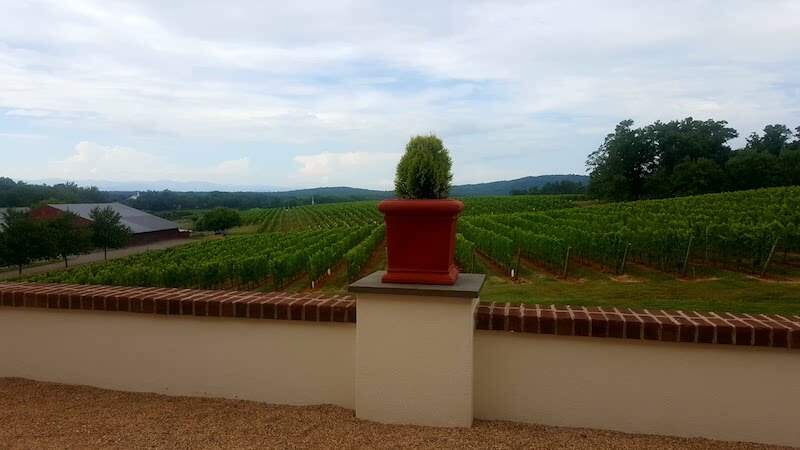 The Monticello AVA is located around Charlottesville, VA (home to the University of Virginia). The area is absolutely gorgeous. I kept imagining that it looks like Napa may have looked 50 years ago! We made the small town of Afton our home base. We spent 5 nights at a cozy cottage in the middle of the wooded mountains that I found on VRBO. 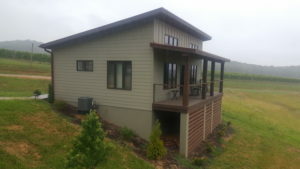 We then spent another 4 nights at the Cottages at Afton Mountain Vineyards. The views here were spectacular. 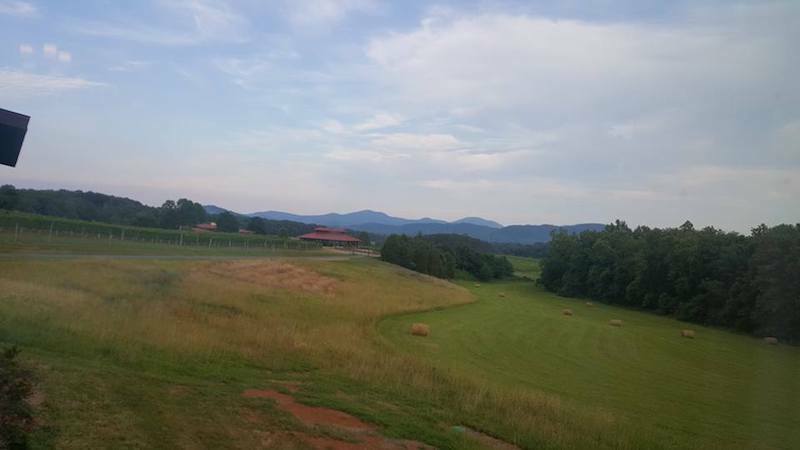 I loved sitting on the deck before dinner with a glass of bubbly and looking at the vineyards and the Blue Ridge Mountains! 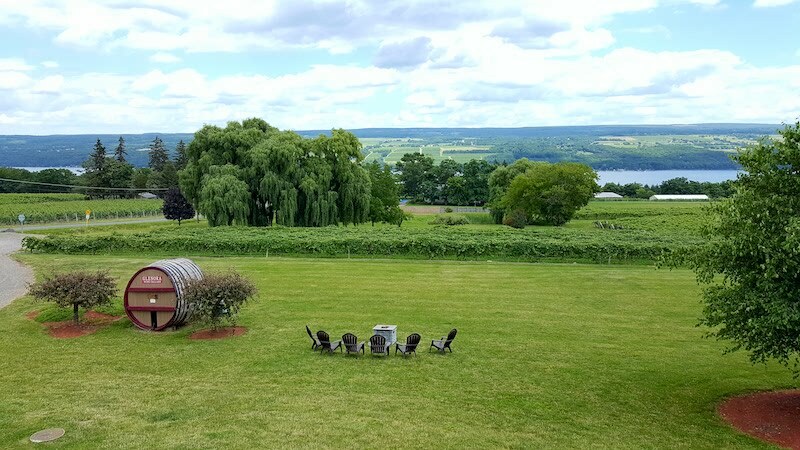 There are a lot of wonderful wineries located nearby. I’m going to tell you about a few of our favorites! 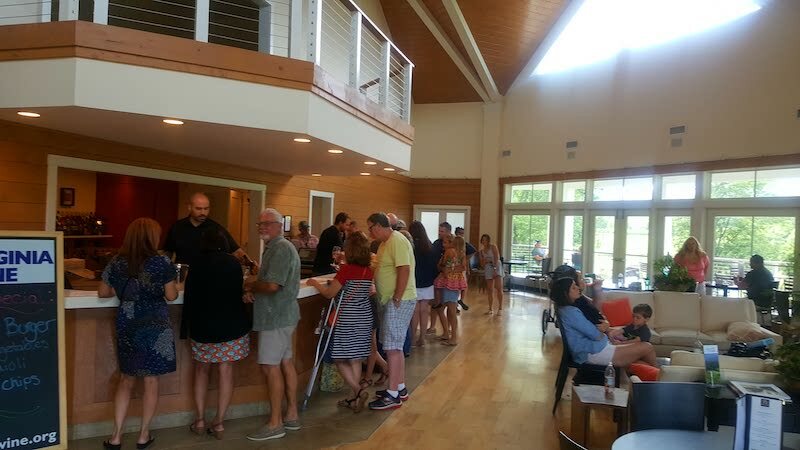 So … if you’re in the mood for wine, beer OR popcorn … Afton, Virginia is a great spot to be! 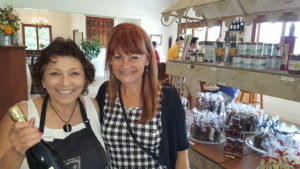 The scenery is fabulous and the people are the best! 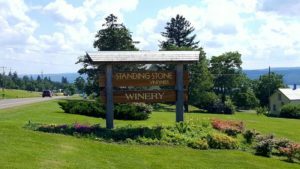 Take it from a former Virginia Virgin, don’t hesitate putting Virginia on your list of must visit wine regions! 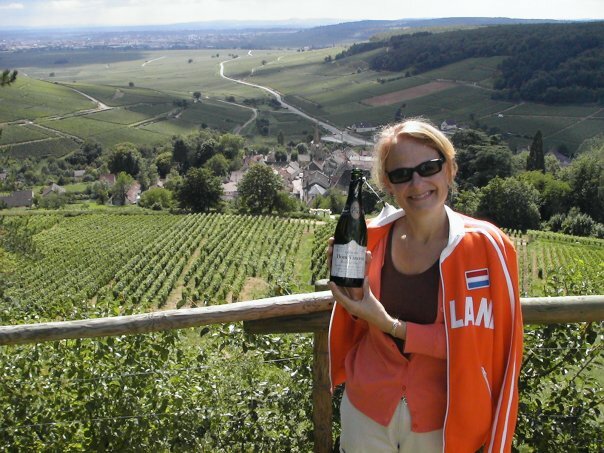 I may be a wine pro, but I also love beer! Another thing I like??? Ice cream! So how excited was I to find a beer and ice cream pairing????? Helloooo!!! 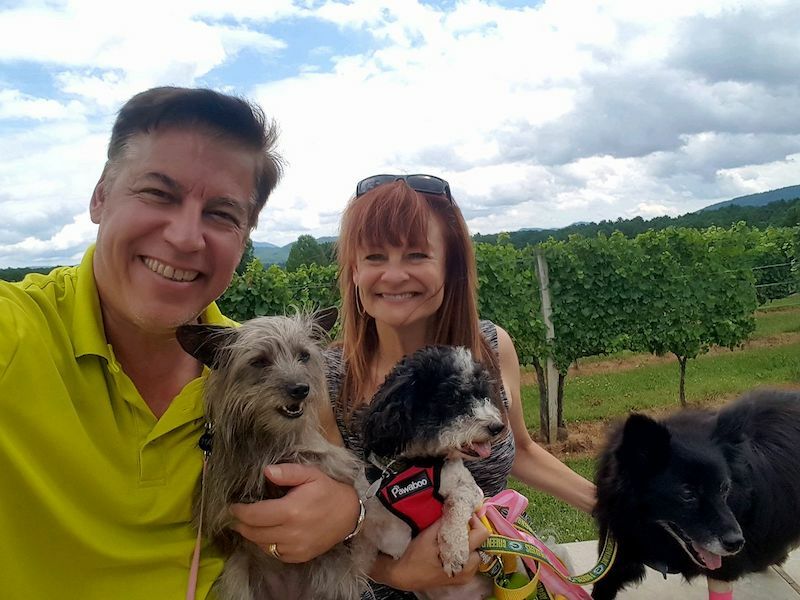 My husband and I (along with our three dogs) are traveling up North for a month to get out of the Florida Summer heat. 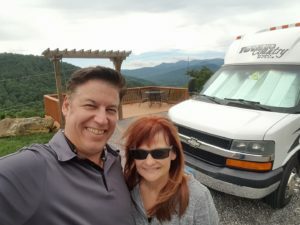 We’re in a little RV with a fridge big enough for some beer and wine we buy along the way! One of our first stops was in Asheville, North Carolina. Asheville is a great city! Surrounded by the Smoky Mountains it’s not only beautiful, but it’s also very fun and hip! 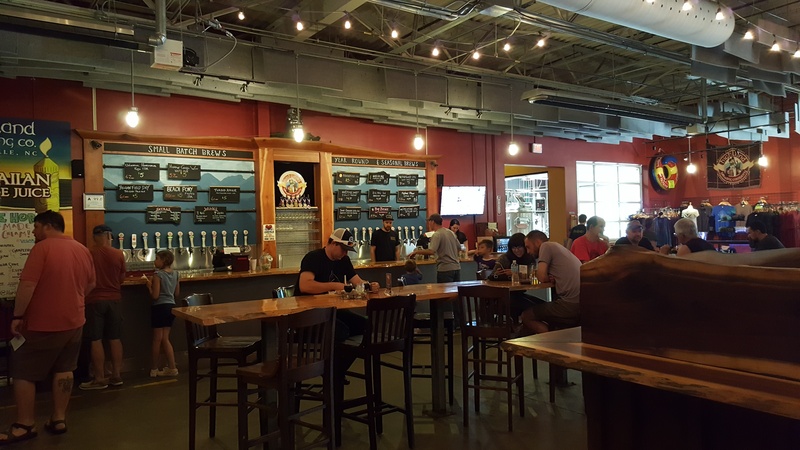 Along with mountains, Asheville has many great breweries open to the public for tastings and/or a great place to enjoy a pint with friends. 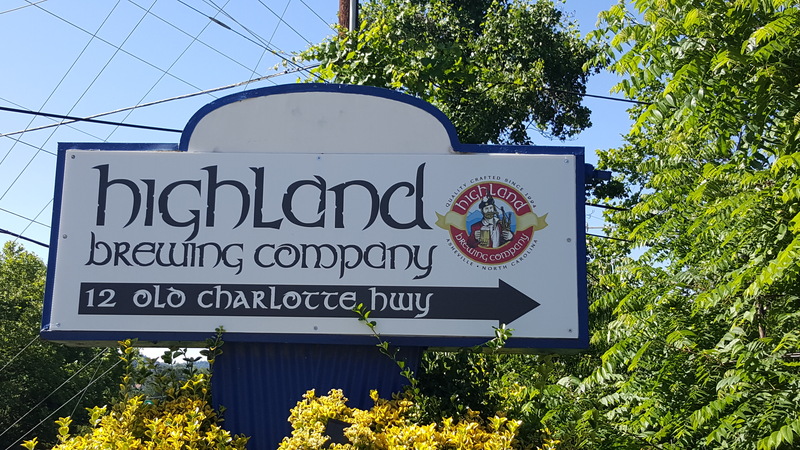 One of those wineries is the Highland Brewing Company. Dog friendly on their roof top terrace, we headed up there with our menagerie and grabbed a pint. 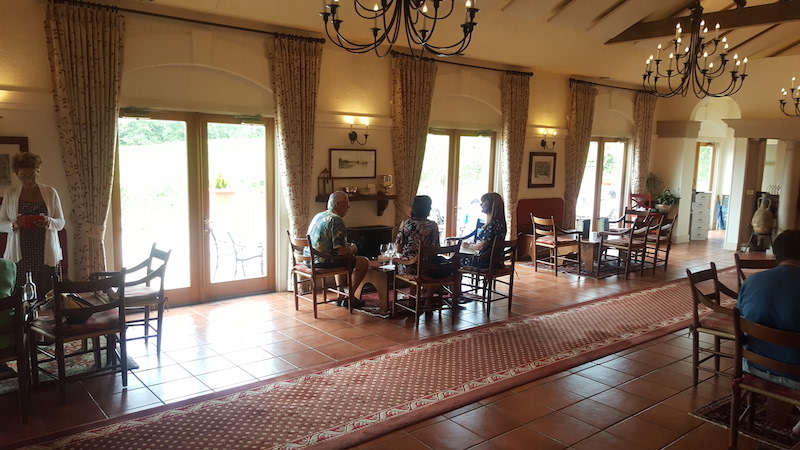 Later, we checked out the tasting room where they were having a beer and ice cream tasting. What??? Heck, we wanted to give it a try. Along with The Hop Ice Cream Café’s yummy ice cream, they were pouring some beers! 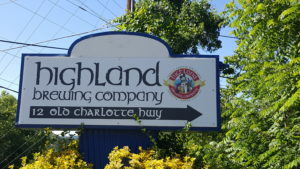 The first pairing was Highland’s Gaelic Ale with The Hop’s Salted Caramel Ice Cream. The salted caramel balanced the hop flavor of the ale very nicely. The salt in this ice cream crunches in your teeth providing a really fun finish. This is good stuff! Although not my favorite pairing of the four, it WAS my favorite ice cream! In fact, we bought some “to go” for our tiny freezer in the RV. The next pairing was Highland’s Daycation IPA with The Hops’ Grapefruit Sorbet. This was a fantastic pairing. The ruby red grapefruit flavor of the sorbet was a fantastic match with the pink grapefruit taste in the beer. Next up was the Oatmeal Porter with Big Briar Raspberry Ice Cream. 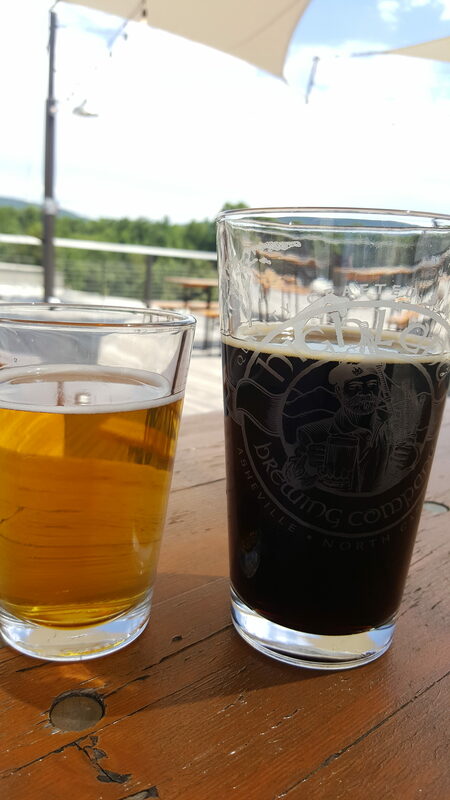 With lots of tobacco on the beer, the raspberry ice cream helped create smooth finish. The final pairing was another great one. Black Mocha Stout with … you guessed it Black Mocha Stout Ice Cream! How could this NOT pair well? 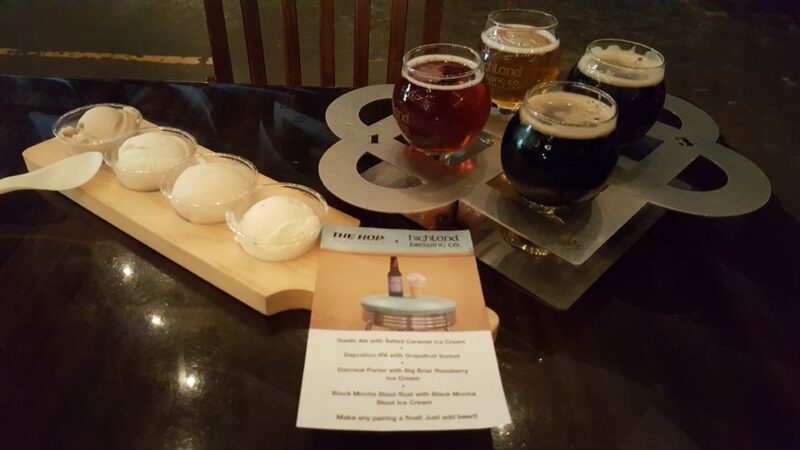 The pairing was best when we started with the ice cream and finished with the beer! So yummy!!! !